Writing his Loadout review, our Tim discovered that Edge of Reality’s free-to-play Quake throwback was secretly one of the best shooters to come to Steam in years. It’s also the only shooter on Steam to let you take your pants off and run about the battlefield with your physics-enabled johnson waggling back and forth like a pendulum for your thumping heart. In acknowledgement of those truths, let’s look forward with all our might to Update 5.0 – Loadout’s biggest update yet. 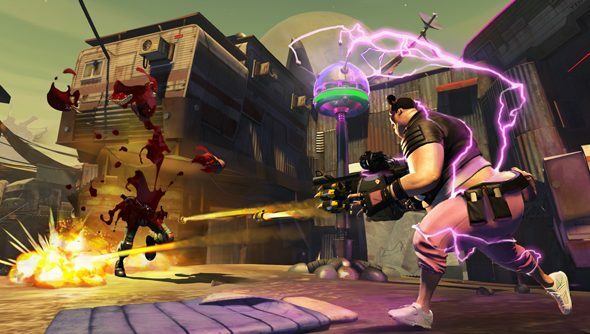 If you never really got on with the straightforward bot-bludgeoning of Team Fortress 2’s Mann vs Machine mode, Loadout’s co-op campaign mode might offer a compelling, and equally free, alternative. The campaign will comprise “many” missions, and will test teamwork, strategy and quick thinking. It’ll be accompanied by new loot and an inventory system – exactly what the game’s deep weapon-crafting system deserves. All of that will be available early in open beta. The beta will begin in the coming weeks, and reward participants with a cosmetic hat: the Alien Brain Scan Deflector. Have you given Edge of Reality’s arena shooter a go since Loadout got its ranked mode? I imagine things got markedly more competitive after that.